How to AirPlay to 8K TV: Get 4k/5k/8K UHD Video and Start Movie 8K New Tricks! 8K TV display is taking the place of 4K 5K videos movies to blast your eyeballs, and will be replaced by even higher pixels to come, for sure. Now to the point: Are you planning a budget on a 8K TV display but got no authoritative review to turn to? Or you paid for that insane Sharp 8K TV but got on movie 8K? Nice to have you here, you'll detect the maximal amount of 4K 5K 8K UHD videos movies to AirPlay to 8K TV. How to AirPlay Movie 8K/4K/5K Quad UHD Video to 8K TV? In the market of 4230p 8K TV and 8K display, the serious problem is a lack of 8K TV channels and 4230p videos movies: Will you blunt the screen with tiny images? Definitely not. Watch out for this 5KPlayer, the first, and best free 8K video player to AirPlay to 8K TV. Cabled TV channels, due to the strict censorship, will lag behindonline 4K 5K 8K Quad UHD movies videos for 6 months. AirPlay 8K UHD videos to 8K display, don't leave the Sharp 8K TV, Apple TV neglected if you don't have this best 8K video player. But how? Online 8K UHD video resources spread faster than you can imagine online. Indeed watching 8K video on PC or Mac is rather convenient, but why waste the 8K TV yards away? See to the 1st premiered Beauties À La Carte 8K movie by NHK, or download the first YouTube 8K UHD video Ghost Towns, all throwing a vibrant punch to your eyes before you even realize. Everything for 8K TV is available online, just download best 8K video player for Windows 10 and Mac and stream UHD videos to 8K TV for maximal ecstasy! But How Can I Download Movies 8K and AirPlay to 8K TV? You don't have to think, the only thing you need to do is remember a name — 5KPlayer. It already discovered, analyzed, and prepared a whole battery of function for you to AirPlay to 8K TV. 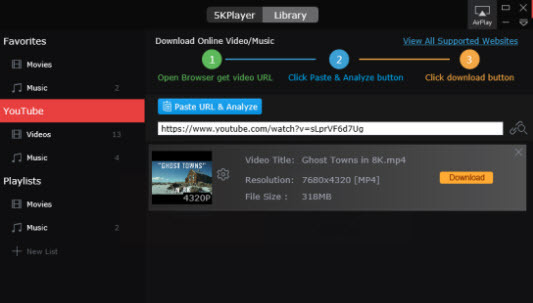 This freeware downloads 8K video from YouTube superfast in any bandwidth environment, serving as the first mature software to download 4K 5K 8K 4320p videos superfast, and sure enough, in terms of your 8K TV Quad UHD display, be it Samsung, Sharp or Apple TV, it envoys every pixel to reach the stunning 8K screen intactly. 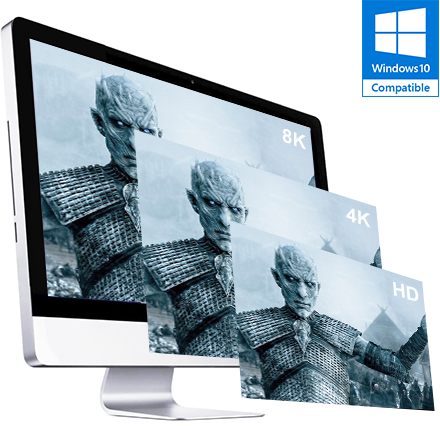 When it comes to AirPlay 8K AVCHD MKV movies, this 8K player software for Mac and PC dares to claim NO.1, for nothig matches it in regard of the sleek 8K playback performance, superfast downloading of 8K videos and the impeccable AirPlay to 8K TV. Moreover, it renders 300+ online video sites for you to download videos! 5KPlayer hates to see a single 8K TV humiliated due to the ineligible Quad UHD video content. So read the following improvements for 8K TV streaming bugs [solved], both AirPlay 8K TV beginners and advanced user are recommended to. AirPlay to 8K TV is the top-notch method to stream 4K 5K 8K videos. It's the lossless 8K video transmission method thatoushines WIDI or other wireless streaming method. Featuring highest agility to push pixels and at the same time rendering no wireless glitches at all. AirPlay technology assents only 8K videos in MP4, M4A and MOV format to stream to 8K TV display. Does this filters another proportion of 8K video resources now that they don't aggregate much? Don't forget you just got 5KPlayer, how could it miss the format issue as an pioneer in AirPlay to 8K TV? Turn to the best converter for Windows or Mac to convert your 8K video for AirPlay. Streaming of 8K movies videos puts higher requirements on bandwidth, thus sluggish networks will most possibly lead to AirPlay to 8K TV video delays or chokes. Yes, to your surprised "WOW" mouth i can say, that this self-integrated AirPlayer for 8KTV preset the option to fix AirPlay delays to 8K TV, and that's what a real player can do. AirPlay to 8K TV, Run the Stunnning 8K Movies! 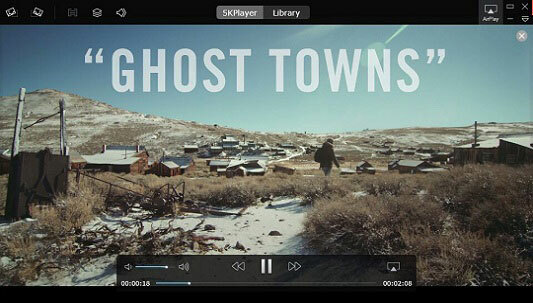 Download 5KPlayer on your Mac/PC, install and launch it. Here Apple TV is taken as an example to AirPlay MP4 8K videos to. You are really recommended to get a nifty trial of AirPlay video to Windows PC from iPhone/iPad/Apple Watch after the heartening experience of AirPlay to 8K TV. Note : Tap the AirPlay icon of 8K video AirPlay server, select your Apple TV name. Please confirm your Mac/PC and the 8K TV for AirPlay are connected to the same WiFi or Ethernet before getting started. Note : The 4K 5K 8K Video to AirPlay to Apple TV can be imported by directly tapping the Video button on the main interface. Similarly, you can stream 1080p 4230p Quad UHD MP4 videos to Apple TV by drag-and-drop action. Note : AirPlay icon in 5KPlayer will turn red if the UHD MP4 MKV video streaming is successful, thus providing an immediate indicator for users to troubleshoot AirPlay not working. Note : The most up-to-date and mature freeware for AirPlay to 8K TV keeps a close eye on any 8K TV AirPlay updates. Its outstanding conversion skills grabs into your AirPlay 8K video library seas of juicy 4K/5K/8K Quad UHD video resources in .mkv, .mts and etc. Even to the most unoticed corner, 5KPlayer solves AirPlay to 8K TV delays hassle-free. Bet you'll flush with the splashing fountains of 4K/8K UHD videos to save from YouTube. Bring your 8K display to life now by playing 4K/5K/8K Quad UHD movies with this top-notch AirPlay streamer for 8K TV. 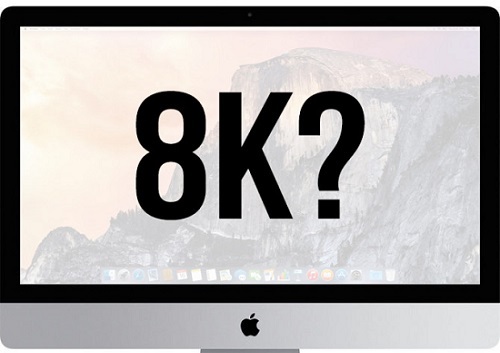 How to Play 8K Movies on iMac/PC? Here you can free download 8K video player for Win 10 that renders perfect 8K videos playback.